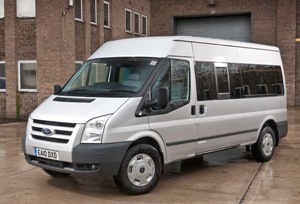 The 14-seater Transit Minibus comes with long wheelbase and medium roof height configuration, it uses rear-wheel drive. This Minibus meets the most stringent M1 European Private Hire Vehicle safety requirements and will carry up to 12 passengers with 1 driver and 1 crew. Crew seat must only be occupied by persons responsible for the supervision and management of vehicle passengers. De-rated 14-seat 3500 kg GVM vehicle so may be driven by non category-D1 license holders. Third, fourth and fifth row dual seat and single seat. Length is 5680mm with a width 2084mm including mirrors. A turning circle 13.3m kerb to kerb. Fitted with tow bar. Note: For non category-D1 license holders towing is not permitted. Engine is the 2.2 Duratorq TDCi diesel combined with Ford ECOnetic technologies. It is a requirement of the Mersey Weaver District Scout Council that all drivers have a valid MIDAS certificate Or completed a separate D1 test. It is a legal requirement that the user must display a current Minibus Permit in the name of the organisation to whom the passengers belong. e.g. Mersey Weaver Scout District in the case of the MWSD Explorer Units/Network or “Xth NNNN Scout Group” for example in the case of the members of a Scout Group. When collecting the minibus the driving licence(s) and MIDAS certificate(s) for all drivers and minibus permit of the organisation will be required to be presented. Copies of documentation will be made by the District’s representive for insurance purposes. Full terms and conditions of use can be downloaded here. Yes (one one of the vehicles), 100kg maximum loading.